As the days continue to grow shorter and colder, we are invited to rest and restore, curl up and draw inward. Compared to the invigorating energies of the summer and fall, this change is appreciated. However, the calmness of winter can be overpowering, causing us to feel stagnant and heavy. The winter, characterized by the Kapha state, is a time of groundedness and slowing down. However, if these feelings are over-emphasized, our internal systems may become imbalanced, leading us to feel dull and groggy. Kapha in excess might lead to stiffness, weight gain, and an over-abundance of phlegm. Some may even blame congested winter noses on an abundance of Kapha. Someone with a Kapha-dominate constitution might feel this way year-round and no matter the season might be difficult to rouse into action. In Ayurveda, the sister science to Yoga, practitioners attempt to find balance through opposites. Since Kapha is a cold energy, we need heat to create balance. Whatever your dosha, or dominant Ayurvedic state of body and mind, how most people eat in the winter is naturally pacifying and calming of the Kapha energy. We are drawn to hot beverages and soups which stoke the digestive fires of Pitta and combat the lethargy of Kapha. Warming spices like ginger, cinnamon and cayenne are great additions to any winter recipe. In order to keep Kapha in balance, exercise is an important part of a winter routine. Since it might be harder to get out of bed these days, adding some physical activity into your morning might shake off the sluggishness of Kapha. 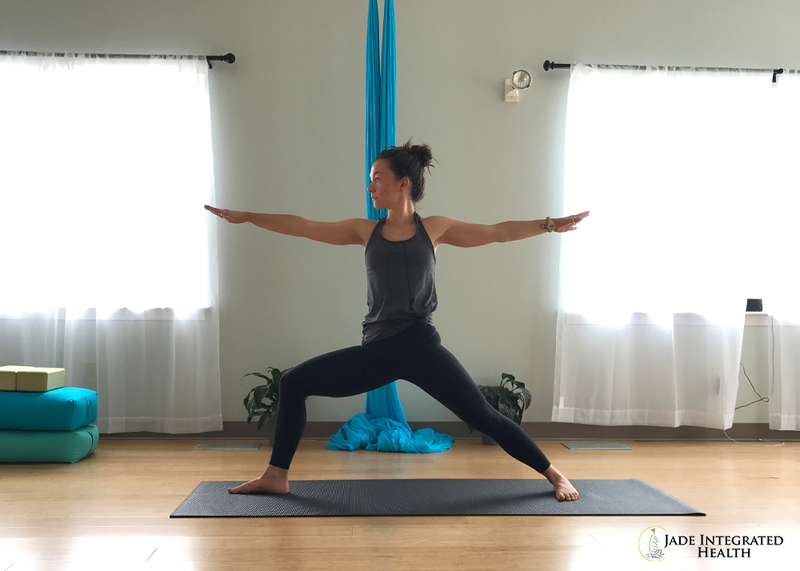 A vigorous snowshoe, ski or yoga practice may help to combat Kapha’s influential forces during these next months -- anything that gets your blood pumping! This is also a time of year where many of us have familial obligations. Even the most grateful individual might become overwhelmed by the constant stream of parties, dinners, and visitors. In these times, it becomes crucial to find a manageable routine to stay present and enjoy all this seaon has to offer. Don’t feel guilty if you have to say “no” in order to give back to yourself. Perhaps the most appropriate yoga practice during these months are the Sun Salutations (Surya Namaskar). This constant flow moves energy and does not allow for any build up or stagnation. If you only have a few minutes, run through a few rounds with the main goal of keeping moving. If you have a little bit more time, following this warming sequence. Start standing at the top of your mat. Inhale and raise your arms over head, stretching to the sky. 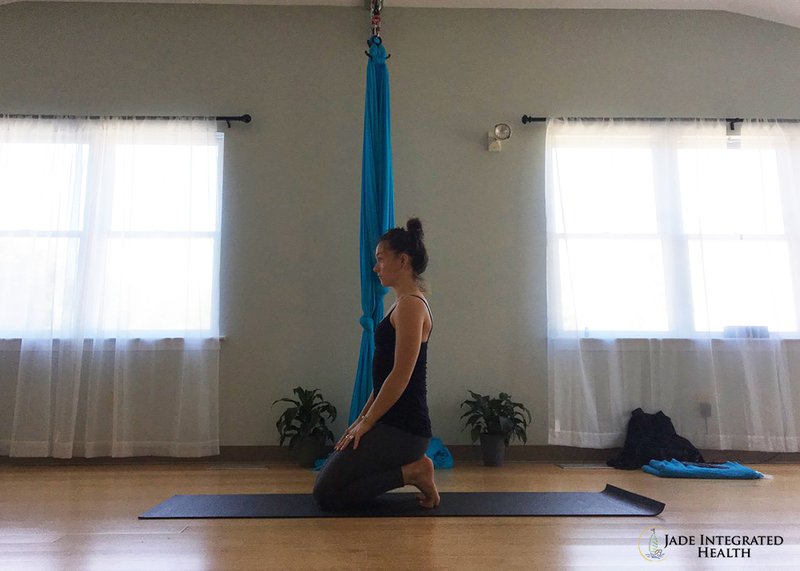 Exhale and fold forward from the hips, releasing the head and spine over the thighs. Bring your hands to your shins and inhale to stretch the spine. Feel the back muscles gently contract to lift you parallel to the ground. Exhale while stepping back to Plank. Inhale to hold plank. Engage your core muscles by pressing into the ground from your shoulders and pulling your naval in towards your spine. Exhale to your stomach or halfway to the floor (Chaturanga Dandasana). Inhale through either Cobra or Upward Facing Dog, inviting opening across the front of the chest. Exhale to Downward Facing Dog and hold here for five breaths. Exhale to step both feet back to the front of your mat. Inhale to lift half way, sending your tailbone back and top of the head forward. Exhale to fold (Uttanasana). Inhale all the way to standing and reach your arms overhead. Exhale, bringing your hands to your heart. Repeat as many rounds as you desire. To add greater opening to the hips, you can step forward and back to low lunge before moving into Down Dog. Begin with a Sun Salutation. From Down Dog, step your right foot forward between your hands staying high on your left toes. Draw your left heel over your left toes to engage the back line of the left leg. Root down through both feet evenly and inhale to stand. Reach arms overhead encouraging length through both the right and left sides of the waist. Hold for 5 to 10 breaths. To increase effort and heat, exhale to bend the left knee so it hovers over the ground. Engage the hamstrings and gluteal muscles to inhale and bring the knee back to straight. Move slowly and with control. Repeat 3 times before switching sides. Step your feet 2 to 3 feet apart. 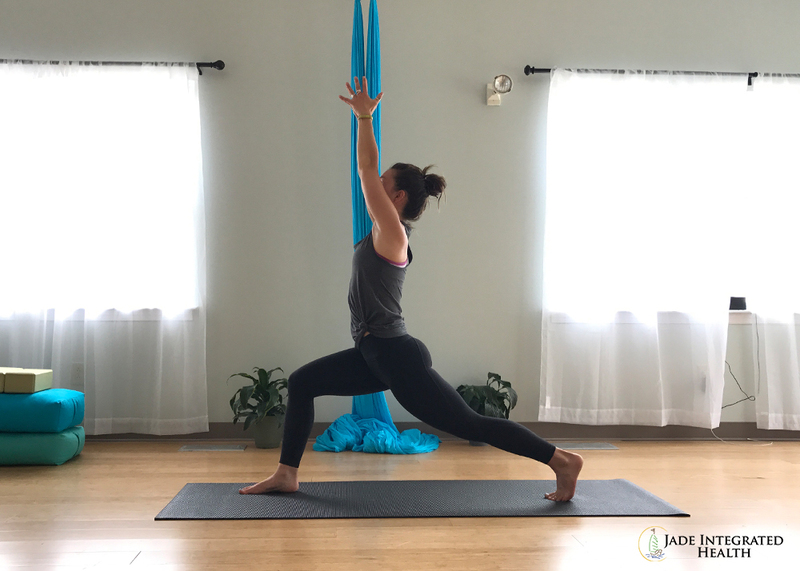 With the right foot turned out from the left at 90 degrees, bend into the right knee and invite a gentle opening across the front of the pelvis and inner right thigh. Both right and left legs should be working the same amount – as much as the right knee is driving forward, press back into the left pinky toe and outer edge of the heel. Arms can raise parallel to the ground and gaze can follow wherever the neck is most comfortable. Hold and feel energy coursing through the body. The energy may present itself as sweat or a faster breath. Try to keep the inhales and exhales even for 5 to 10 breaths. To switch sides, move through a Connecting Vinyasa (Plank  Chaturanga  Cobra or Up-Dog) before Down Dog to continue to build heat within the body. From Tadasana, exhale to bend the knees bringing the sitz bones towards the heels. Find equal weight distribution between the right foot, the left foot, toes and heels. Inhale to lift ribs away from hips and hands to the ceiling. Gently draw the naval to the spine to maintain strength through the core and keep the spine supported. Palms can press together and gaze can follow to the thumbs. Hold for 5 breaths and exhale to fold forward (Uttanasana). Feel free to combine Chair pose and Warrior 2 with your Sun Salutation for a few rounds of Surya Namaskar B. Come into Chair as outlined above. Inhale and bring palms to touch. Exhale to twist and hook the outside left arm (the tricep) around the outside of the right knee or thigh. Inhale to lengthen the spine and exhale deeper into the twist. Feel the left shoulder roll back and away from the ear and breath into the right lungs to find more comfort in the twist. Press the elbow into the knee and the palms together to open the chest. Stay here for 3 breaths and exit on an exhale either back into chair to into a forward fold. Repeat on the second side. From Down Dog, inhale to lift the heels and exhale to bring the shoulders forward over the wrists. Inhale to gather strength through the belly and exhale to press into the ground. Try to engage the upper back muscles by spreading the shoulder blades without rounding the spine. Squeeze the inner thighs together to stay active through the legs. Gaze should land 6 to 8 inches in front of the hands to keep the head in line with the spine. Hold up to one minute while maintaining a steady rhythm of breath. From Plank, shift more weight into your right hand. Roll onto the pinky toe edge of your right foot and stack your left foot on top of your right. If you need more balance, keep your left toes down in front of your right foot. Press into the right hand from the middle of the back and inhale to lift the left hand straight to the sky. Feel both arms reaching to the sides and try to find greater space between the shoulder blades. Draw the front of your rib cage in towards your center and find a straight line from head to heart and hips to heels. Engage the outer right hip to support your torso lifting. 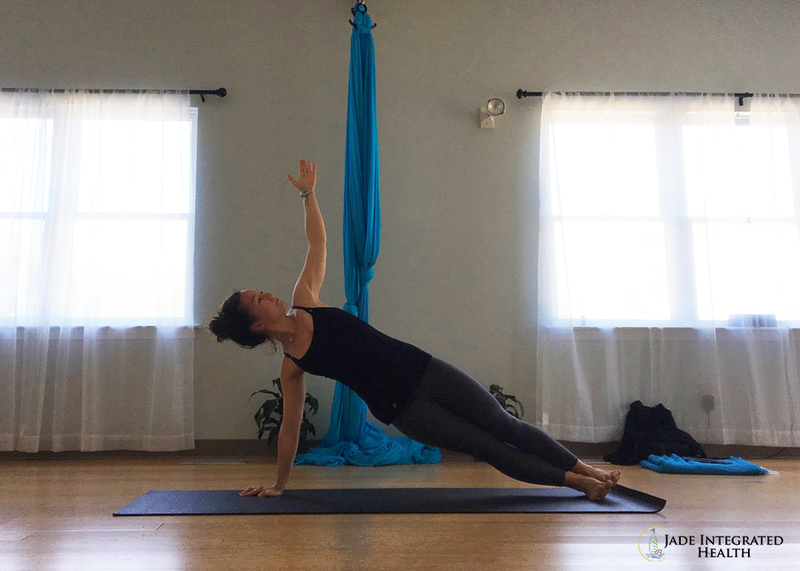 Hold for 5 breaths and repeat on the second side either just moving through plank or a Connecting Vinyasa. Bring your shins to the mat and tuck up all ten toes. Sometimes the little pinky toe doesn’t want to cooperate so manually bring it forward. Exhale to sit hips to heels. This is a wonderful stretch for the soles of the feet especially after spending time in thick wool socks and snow boots. Stay for 10 breaths. If you notice your breath gets jagged or held, consciously try to find release. Challenge yourself to sit with the discomfort. To continue building heat and energy, consider adding a few rounds of the Kapalbhati breathing exercise. This breathing, also called the Skull Shining breath, is a traditional purification practice that helps to clear the digestive tract and strengthen deep abdominal muscles. Find a comfortable seat, perhaps with the hips raised on a blanket or block. Take a few deep breaths through both nostrils. Make a fist with your right hand and place it on your low belly, beneath the belly button. For beginners, this gentle touch may help to keep awareness on this space but feel free to rest both hands on the knees. Inhale deeply to begin. To exhale, quickly contract the low belly muscles (where your hand is resting) to forcefully push the air out the nostrils. The naval should feel like its drawing in and up towards the diaphragm. When these muscles release, air will passively be drawn into the lungs, making your inhale automatic. Continue this pulsing for 20-30 rounds to start, slowly adding more breaths as strength and stamina improve. Repeat for 3 to 5 rounds, taking a few deep and even breaths in between.